Roll and Stroll is a community service program created by AARP Chapter 2426, to teach seniors how to use public transportation for fun and convenience. 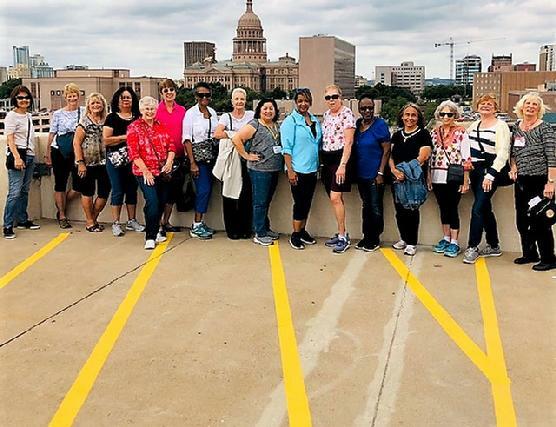 Each month we take group trips around town to enjoy the beauty of living in Austin. A ride to the Central Public Library to view an exhibit in the events center which features art from the West Austin Studio Tour. The West Austin Studio Tour takes place during two weekends in May. The exhibit at the library gives individuals a preview of art work which can be viewed at participating galleries. A twilight tour to Mueller Farmers market with early dinner at BD Riley's Irish Pub at Mueller. Women who know how to Roll and Stroll! These women are filled with laughter and an appetite for adventure. That’s no bull!! 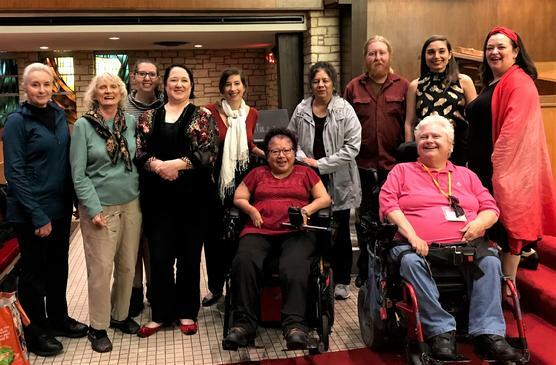 The Roll & Stroll group went to a concert at Central Presbyterian Church on Feb 14. AARP members enjoyed the concert performed by One Ounce Opera Company featuring love songs for Valentine day. Friday October 12 - Please arrive at Wheatsville at 10:15 with bus departure at 10:30. We are headed for the historic neighborhood of Clarksville in West Austin. Held each fall in and around the State Capitol in downtown Austin, the Festival features a variety of literary readings and panels, book signings, cooking demonstrations, live music, local food trucks, children’s activities, and exhibiting vendors from across the state and country. Roll and Stroll trips to the new Austin Library and to the Central Presbyterian Church concert. On May 25th, we explored some Asian culture at a large supermarket and ate at Japanese restaurant named Kula which featured a revolving sushi counter. We selected our food as it floated past us on a conveyer belt. We didn’t know what we were eating but we enjoyed it. On June 1st we did a twilight stroll with dinner at Gloria’s. The group of 16 energetic seniors have declared this is one of their favorite spots in downtown Austin. We explored the historic building near the Capitol known as the “Old Bakery and Emporium. This city of Austin project features senior craft items on consignment. The previous plans to visit Chinatown have been changed. Additional information will be announced at our February meeting. I am awaiting schedule information from Chinatown Center which announced that the celebration will occur on Sunday Feb. 25th. We will depart from Wheatsville at 5:15 p.m. to arrive at City Hall prior to the opening at 6:00 p.m. Be prepared to stand in a short line to go thru security. Carry a small purse. We went last year and had a good time. We will not stop for dinner as heavy snack food is provided at the event. If we are still hungry we may stop after the event for dessert. MARCH 3RD – SATURDAY – Explore the University of Texas – An open house event with a visit to many campus buildings. This annual event always attracts a large crowd. MARCH 16TH – A trip to Mueller to visit an Irish pub prior to St. Patrick’s Day. More information at our February meeting. 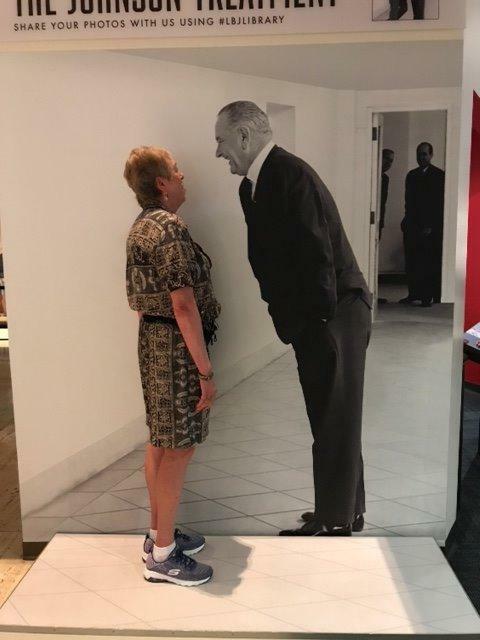 Dolores Macaluso Visits with Lyndon Johnson at the LBJ library. Marilyn Totten explores thrift store during recent Roll & Stroll to lower Burnet Road. On Friday. 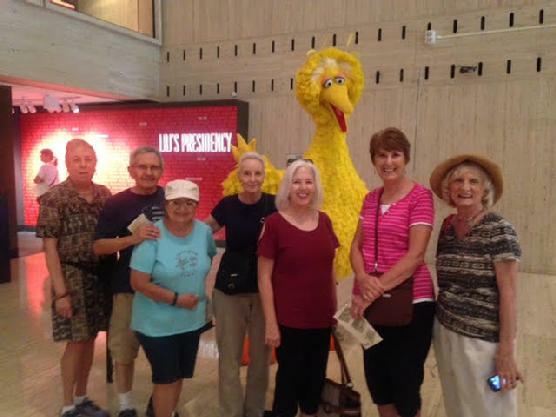 August 11th members explored Jefferson Square area with lunch at Russell’s Bistro. They visited also visited the shops at Kerby Village, Seton Cove and All Things Celtic. They cooled off by visiting a florist shop with a large refrigerated storage room full of flowers and warmed up with coffee at Anderson’s coffee and tea shop. Members stopped at the CapMetro Transit Store for a visit before continuing to dinner at Maudies. Chapter 2426 members traveled on 338 to Hancock Center. They did some shopping and ate lunch at Jason’s Deli. On the way back South we stopped at 9th & Lamar to visit Book People. Reboarded the bus and went back to our starting point of Wheatsville. All buses were on time with courteous drivers. A great bargain for $1.25 roundtrip! 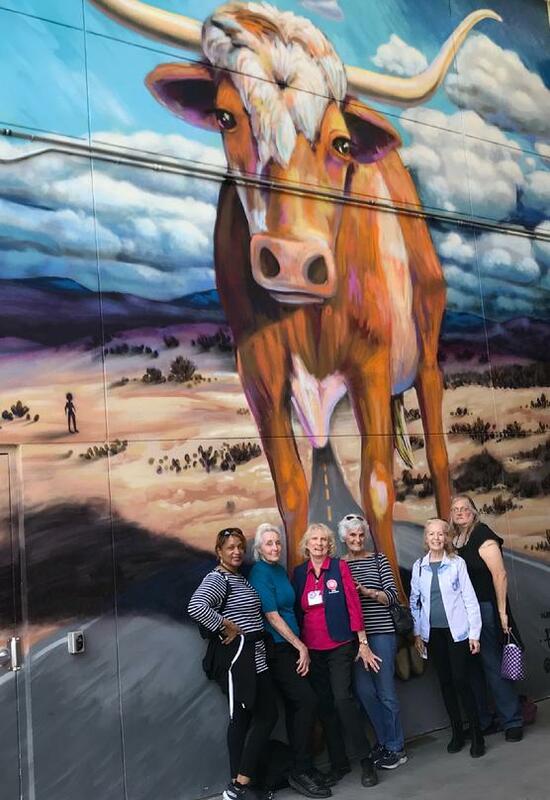 Members enjoyed the bus trip to the Farmer's Market in downtown Austin and another trip to the Triangle. We enjoyed entertainment by young ladies from Ann Richards School.